Since November, I have been on the planning committee for the Arts, Culture and Technology Meetup group, where we plan monthly events that show the intersection between the arts and technology. Our March event, in conjunction with the Roger Smith Hotel, was a weekend long conference to introduce social media to artists and people in the arts fields aptly named Social Media Art Camp, aka SMart Camp. The event started for us Friday night with a cocktail reception in the Roger Smith solarium. the theme was “dance party,” and the night was DJed with live video mixing by Panman Productions, the in-house video production staff at the Roger Smith. Although no one actually danced, there was a good turn out of attendees who were around NYC or staying in the hotel, and everyone drank, mingled and enjoyed themselves. Saturday morning, bright and early the second day began with a keynote by Marc Schiller of the Wooster Collective. The day’s panels continued on featuring Social Media Case Studies, Planning for Social Media, Mobile Technology, Video Basics, and Video and the Web. The most unusual moment of the conference occurred when John Birdsong of Panman Productions during the Video Basics panel, when he chose to demonstrate Chat Roulette for the audience, a service that allows users to video chat at random with other users. Saturday night was a time to make art with Dr. Sketchy’s Anti-Art School. Led by Molly Crabapple, a speaker on the Social Media Case Studies panel, Dr. Sketchy’s is live model drawing with burlesque models, in this case Raquel Reed. With timed poses of varying length and contests relating to drawing techniques and themes. The event was also live streamed to an event in Pittsburgh that was occurring simultaneously, allowing interaction between the two cities. I hadn’t drawn in years, but attempted my best to do some character sketches during the event, none of which I have chosen to put online at this time. The final day began with our second keynote by Maria Popova of Brain Pickings, a great site for seeing the unusual curated in one place. This was followed by panels on Creative Commons and a Startup Demo panel to show off several art based internet startups and introduce them to this audience. The second half of the day split the crowd. A portion went to Social Media Bootcamp, where they broke down into groups of five and were led by a social media professional and helped teach the participants how to build a social media strategy for their art. The rest of the conference attendees were treated to panels on Community Building, Metrics and Blogging. The weekend was full of thought provoking ideas both in the panels and among the attendees. As a member of the Arts Tech committee, I spent most the weekend working the event and missed parts of panels. 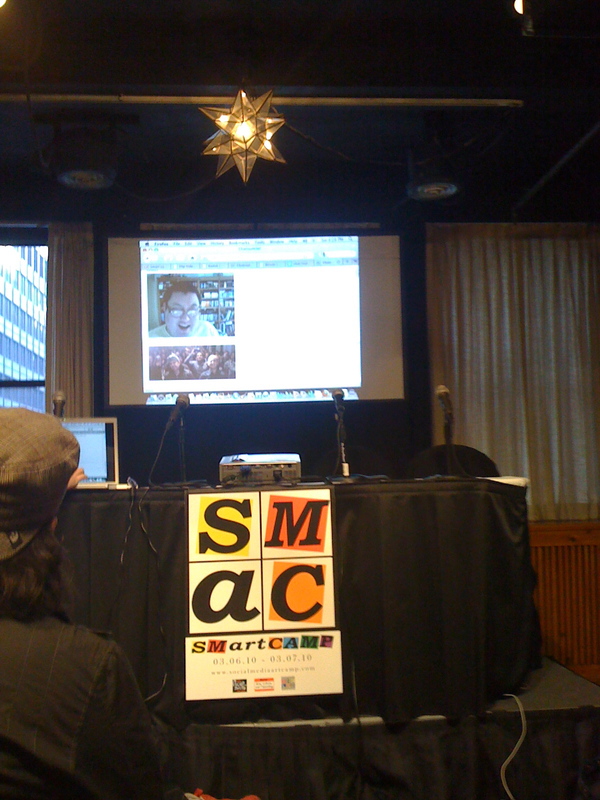 Thankfully, the panels were all archived on Ustream at the SMartCamp page, where over 600 people viewed the stream at once and over 120,000 views over the course of the weekend, plus #SMartCamp was a trending topic on Twitter in New York City. The response to the event was overwhelmingly positive by both in person and online attendees. While we who worked on the event are still recovering and don’t even want to think about a potential next one just yet, I’m sure there are a few things we can fix and change for next time. I know I would like to see social media integrated better next time and allow the people watching online to have a voice at the conference, since the point of the conference was to further social media in the art world. And Shout-outs to those of us who worked on the event. The Roger Smith Hotel staff, who had the original idea for SMart Camp and asked the Arts, Culture and Technology Meetup for assistance and ran all the food and event flawlessly. Panman Prodcutions for running the video all weekend and live streaming it all to Ustream. My fellow Arts Tech committee members, we make a damn good team together. And to Julia Kaganskiy, the leader of the Arts, Culture and Technology Meetup group and who was brilliant in getting the panels together and leading us all on to victory. Thank you to everyone who attended the event for coming. Thank you for everyone who watched it online for joining us virtually. And to keep up with all future events, including our monthly meetups and any potential future SMart Camps, join the Arts, Tech and Culture Meetup group.